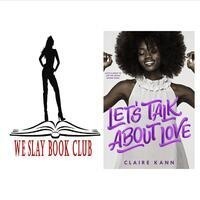 Read and discuss Let's Talk About Love by Claire Kann. Alice had her whole summer planned: nonstop all-you-can-eat buffets while marathoning her favorite TV shows (best friends totally included) with the smallest dash of adulting―working at the library to pay her share of the rent. The only thing missing from her perfect plan? Her girlfriend (who ended things when Alice confessed she's asexual). Alice is done with dating―no thank you, do not pass go, stick a fork in her, done.